It was one of those ridiculous opportunities for friends to visit a friend studying in Florence for the semester, so we had to take it. My sophomore year of college, I skipped some classes and hopped on a plane (for $444 round-trip) with two friends to visit and see Italy for a whirlwind week. I had no idea how important the things I would see would be, I had no idea how important the place itself was, and I had no idea how absurd it is to live so luxuriously as a teenager…hopping off to Italy. My first trans-atlantic flight, through Paris, and finally touching down in Rome. It was a little after lunch time, and we hit the train station connected to Rome’s airport. I was first in line, and I bought the ticket I thought I needed to board the train I thought I wanted to ride to Florence where we would meet up with our buddy. Should have been safe enough. Alone. 19 years old. First time in Europe. No phone, no language, no numbers, nothing but cash and passport and luggage and ignorance. It was entirely made of metal. The bench, the ceiling, the panes of the windows, the poles down the middle of the cars to hold onto if it was packed. It was also almost completely empty. I sat down right inside the door of the car I had entered, and pulled out my journal. 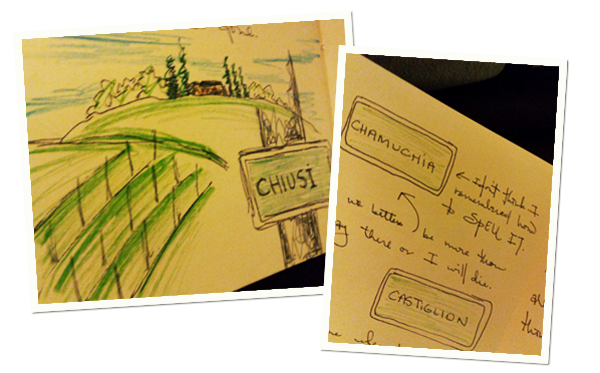 I started drawing the signs of towns that we were stopping in, because the train never seemed to make it to Florence. I learned once I finally arrived that my other two friends got on their train an hour after me in Rome, and arrived an hour earlier in Florence. I had paid for a a ticket on the deluxe train, but boarded the cheapest, slowest, most-stopping train between Rome and Florence. But I was on it, and we had left the station already when that knowledge was given me. I learned that I had made some mistake when the man in uniform on the train came in, asked to see my ticket, then asked again in English, then looked at my ticket, and then started pointing (at what I think was where the direction of the station in Rome) and back at my ticket. Yelling. Alone. 19 years old. First time n Europe. No phone, no numbers, no language, nothing but cash and a passport and luggage and ignorant innocence. About ten seconds in to the man yelling, another passenger from across the isle stood up, walked to the man in uniform, pointed at the ticket, pointed at me, pointed at the man in uniform, pointed at me again, all the while yelling at the man in uniform. My ticket was punched, thrown back at me, and the uniform left. “Thank you,” I said, where the tone of the sentence lands somewhere between a question mark and a period. Ten years later, I struggle often as a Social Worker with what language to use about voices, and dignity, and those on the margins. As a middle class, white male who is a Christian, is my responsibility to “give voice to those who don’t have a voice” or “be the voice” for someone? I’ve wrestled this terminology not for being of being politically incorrect, but for concern over the paternalism in all those phrases. In both therapy and community work, I find myself often in the role of advocate, but I still struggle over what that actually means, what I am actually doing, and whether it is the best thing to do that causes the least potential harm. How to help, how to view the scenario, and how to speak about it in ways that push dignity and justice. For whatever reason, tonight, thinking about that trip to Italy and remembering my train ride, nineteen years old, alone, money and passport, ignorance and innocence; I was in someone else’s world, and someone who knew the language of the world I was in spoke up for me, defended me, and stood––quite literally––between me and the opponent. The fault was mine, the inability to communicate was mine, the problem was mine, but a stranger stood up, stepped in, and made peace. There are times when my clients, my friends, families in my community are in “my world” where I know the language and know the games, and I step in on their behalf’s. There are times in return where the world is theirs, and they are my only hope. Reciprocity is inherent, and a beautiful thing. And it’s all helping me better think about people and advocacy and helping and voices. “It’s nothing.” He said as he went back to his seat. Very nice post. I can’t believe I have never heard this story! Sometimes a moment happens that so we know will parallel something else, but have no way to record the event, or are so focused on the happenings that we miss the specifics. Way to go immortalizing a below average train ride…if for nothing else, if they found the body with the journal in your bag, they would have some clues as to where you had been. HA! Your password is 100% true, and while i don’t remember it exactly, I remember what it says, so have no worries. You type the truth. But it was true, of course.